Home → Hot Topics → Can I Paint My Propane Tank? Large or small, a propane tank can sometimes be an obvious addition to a home’s landscape. It’s only natural that a homeowner would want his landscape to be attractive, and a propane tank can seem quite an obstacle in this instance. The short answer is YES, you can paint your propane tank. It’s important to remember, however, that you can’t paint it just any color, nor can you use just any paint. 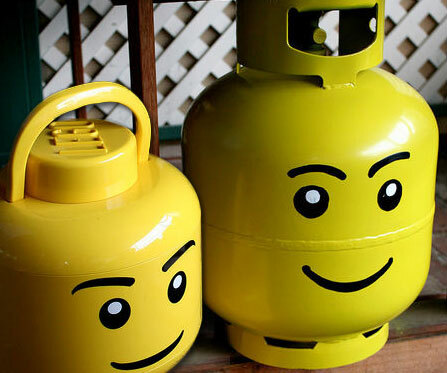 The National Fire Protection Association (NFPA) has set standards for the color of propane tanks. At the most basic, these standards state that tanks should be painted a light, reflective color. In fact, there are several restrictions on the color and type of paint that should be used. Not only does the NFPA set standards, there are also federal and state laws (the latter of which depend on where you live) that also figure into safety and serviceability of your propane tank. Common colors used for propane tanks include silver, white, and light gray. Other light colors such as beige or pastel colors may also be acceptable; contact your propane supplier for guidance on this issue. Think back to science class. You likely learned that dark colors absorb heat, while lighter colors reflect it. As a compressed gas, propane is affected by expansion and contraction based on temperature. A dark-colored tank surface absorbs heat and causes expansion of the gas, the pressure of which can lead to the safety valve on your tank opening, causing gas to escape. Another issue is the combustibility of propane; exposing the contents of a propane tank to high temperatures through the absorption of heat due to a dark paint color can create a significant risk for combustion. Only paint designed specifically for metal surfaces should be used to paint your propane tank. This paint includes a rust inhibitor, which is important for the structural integrity of your tank. Keeping your tank rust-free or arresting the development of rust on your tank will go a long way toward the safety and longevity of your tank. What if my tank has rust? Rust on a propane tank should be addressed before you paint. Rust is a dark color and will contribute to the absorption of heat, as well as lead to pitting of the tank’s surface, which can damage the structural integrity of the tank. Rust should be removed with a wire brush or sandpaper before painting. An excessively rusted tank may need to be replaced – consult your propane supplier if you have any question about what constitutes too much rust. What if I want to do more than paint my tank? There are other methods to help your propane tank blend in with your landscape, but you should discuss these with your propane supplier before you use them. Decorative fencing, landscape shrubbery, trellis structures, and designs painted on your tank may have an effect on tank safety and the ability of your supplier to service your tank. Safety is of utmost importance, and your supplier can help to guide you in making your tank both safe and attractive in its environment. Want some help with your propane? We have locations in Henderson, Bicknell, Livermore, and more!